Find attached 10 miniatures built by geoo and me. Width is at most 320, which is half the default level width. Height is at most 200, which is half the default level height. Number of lix is at most 9. Total number of skills is at most 9. The width/height restrictions are inspired by Gronkling's small maps. Gronkling explained how the small levels would happen naturally for him. I was envious and decided to build a couple small maps, too! geoo and I made these several months ago. Originally, I've wanted to hoard them until I had a proper pack. But I haven't worked on small levels recently, therefore I'll release them without pack polish. All levels are proven solvable under 0.9.x physics. Attached solutions to all of Simon's levels and three of geoo's levels. For the other two I have ideas, but I miss the variable SI to time my lix correctly. African Wigwam: Intended! It deviates from my intended solution in the final 2 skill assignments. Will probably remove Nepster's variant because it's hard to execute. Overhead: You cancel a different digger by building, which leads to an accepted alternative that saves entirely different lixes. My solution saves a non-climber from the left hatch instead, which requires the final digger that you have left over. I'll leave both solutions in. The main idea is freeing the right crowd with a climber from the left hatch, and it looks like all solutions must do that. At the Pond: You free the blocker and bat over the pond with the same batter, otherwise it's my solution. I'd like to make yours the intended solution, it's a good skill save. I really like the idea of miniature levels. I think they fit my playstyle best. 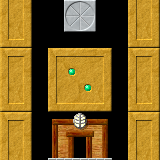 I can deal better with one compact puzzle than having to go through a long level. And there are less possible combinations what to do so that I can even solve those things on my skilllevel. Insofar it's really cool that you made those levels. I have attached solutions to all ten (played on v. 0.8.4). Getting the timing for the batter in "African Wigwam" was a bit finicky for me but I don't have much experience with this game. I kind of liked the frog in the sand waiting for its prey. I actually liked the leeway that the extra batter gives you in "At the pond". In "Jerboa Garden" I could save the digger but this was a level where I had to puzzle around a lot to get to a working set up. "Overhead" was quite nice for me since I could basically see what to do very early. Unfortunately I stepped in every mistake I could make. "Diodes" felt somehow very classical. "Frog Fractions" was a nice and not too hard of a level. "Parrot cage" had a nice puzzle. I tried for a long time a wrong approach in "Solitary Confinement" but actually the solution is not even that hard. "In the cubicle" was much trial and error for me but the title hinted at least at what to do. Is there a way to assess how to do the block? "Rock on the Block" seemed to be dependent a many different aspects if it works out well: when to start the digger, when to bat, when to use the bashers. I thought my successful attempt would fail but magically worked out. But this was generally the level that I solved last since I had no idea how to approach it for a long time. Thanks for playing, and welcome to the forums, Forestidia! I'm super happy that you joined because of these levels -- I didn't imagine they would make such an impact on anyone. I wholeheartedly agree that the forced simplicity is refreshing; we'll still have large levels, too. Surprisingly, even among these small levels, some became harder than intended. I thought that happens only with large levels because designers underestimate distractions by side ideas and decoration. At the Pond: Intended! Yeah, I'll keep 3 batters for lenience. The core trick is to turn with batters near the exit. African Wigwam: Intended! Yeah, the batter is precise. I consider it OK because it's immediately at start, and almost everything else fails, pointing to this batting idea. After the second digger is halfway through, assign her miner. This will delay her breakthrough, allowing the builder to climb and bonk. Hey, welcome to the forum and thanks a lot for playing our levels and the commentary. Good work on solving the levels, I think some of them, in particular 'Rock on the Block', are quite tricky. I'm going to comment on your solutions to my levels. "Frog Fractions" has many slightly different solutions I think. I slapped it together at some point and don't care about it that much, so I'm not sure I want to narrow it down to a single solution, but I attached a variation of the level that I think might enforce the intended one. "Parrot cage" is the intended solution. "Solitary Confinement": this is the same solution that Nepster found. My solution is maybe a little bit more hidden, but I'm not sure I want to enforce it. The level doesn't have to be hard. If you want to look for the intended solution, you can try the attached version though. "In the cubicle" is a backroute. It's my fault for not testing is properly, I expected something like this might be possible, but didn't have time to test. I attached a fix. The solution should work without trial and error. "Rock on the Block" is in spirit of the intentional solution. I place the digger near the blocker, so it can release the trapped lix and that one can bash, but your variation works as well. It feels a little bit random, but I think there's quite a bit of leeway in the execution as the basher assignments have 3 possible vertical positions for them to work. Thanks for the feedback on my solutions. I have solved your 3 alternative/new versions, geoo, and attached the solutions. Edit: I forgot but I noticed that the alternative "Solitary Confinement" level has only save one but I guess one should save all three (, which I have done in my replay). My solution is actually kind of the inverse of what I tried the whole time before I got to the alternate one. I attached a fix for Solitary (changing the requirement to 3/3, thanks for the remark) and also a minor change to Frog Fractions. Frog Fraction: I actually used platforming over the frog before Nepster found my intended solution (which I had forgotten by then). 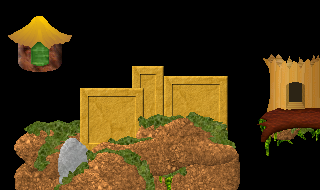 Cubicle: If the second platformer brick hadn't made it in time, your lix would have splatted. When I realized I could use the brick through terrain trick, I actually increased the height of the level to require it. Have solved the new "Frog Fractions" and attached. Note: I renamed your level file to "frogfractions_alt2". To "Solitary Conifinement": My biggest problem generally with the level was that I didn't realize that using the digger first lets me manipulate where the miner tunnel goes (, which is required in both solutions). The intended solution maybe uses a bit more the gimmick of the level, that it wraps around. To "In the cubicle": I tried the overfinicky method because I ran out of ideas. My first method seemed viable to me since I have played other lix levels that use the quirks of the cuber. Ironically I thought the upper platform was too long since it made it more difficult to perform my solution but instead it was a bit too short to prevent the solution from being doable. I actually splatted one of my lix in one of my new attempts because I started the platformer too early. To "Frog Fractions": Having done three different solutions I think the variability fits the level. None of the three seemed to be particularly harder or easier. It seems rather one of the easier levels and to such different solutions seem to fit. Edit just for clarification: With "attached" I mean of course "attached the solution". (I hope nobody got that wrong. I'm very insecure about such things). I solved one or two from each I think. They had pretty neat or clever solutions. With good stinking discussion. Thanks mobius for reminding me. All level replays are attached below. Jerboa Garden: You have 70 % of the intended route, but turn the builder in a different way than intended. I'm considering to put steel below the builder's assignment spot, miners 1->0, bashers 1->2. African Wigwam: Very close, I'll keep this! The intended route bats from higher on the mountain and doesn't use the digger before batting. Diodes: Cute trick, will let it stand! It's very much different than the intended route, but that's fine. 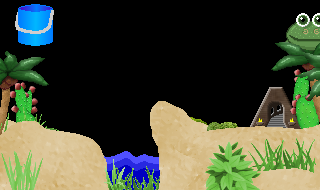 The intended route creates a climber-impassable ledge with the platformer, and sends the climbers on a detour to the left for delay while platforming. geoo's levels: I didn't examine Rock on the Block because haven't solved myself. Everything else looks like my own solution. Nice! I skimmed through the video. Solitary Confinement was solved very complicatedly, but nonetheless a cool solution. You didn't stick with any level for long, but what you did solve, it looked very much intended or acceptable. I'm considering to include these levels in the Lix main download. geoo, are you okay with including your levels in the Lix main download under CC0 (same as all existing levels in the Lix main download)? For the directory structure, it's getting tricky. You designed 5 miniatures in 2017. I've released 5 miniatures here in 2017 and have designed 3 more in 2018. And then I have designed 4 standalone levels in 2018 that aren't miniatures, but should be released nonetheless. My so-far-unreleased 3+4 levels are attached to this post, in case it helps the discussion, and also as a cultural backup. I feel like everything should go into some subdirectory structure in levels/single/misc/. But the exact directory structure, should it separate by release (thus separate the 10 miniatures from this thread from the 3 new miniatures), by author (thus split the 10 minis from this thread apart), or by miniature status (thus make a completely separate dir in misc/ for my other 4 levels)? For me it's similar, in addition to the miniatures I also have a tiny amount of levels sitting around that I haven't released yet. The miniatures were released as an entity an make a coherent small pack of levels. So I'd propose to have them in levels/single/mics/miniatures, and any future miniatures that fit the spirit as well, and we just decide on an ordering of the levels (without author-specific subfolders). Kinda similar to your and Forestidia's Xmas pack. We'd then release our non-miniature levels in author-specific folders within misc. I like your proposal with 3 directories: all miniatures, all non-miniatures by geoo, all non-miniatures by Simon. The miniatures have strong coherence indeed. I won't work on this collection immediately. If I need replays or can't find levels, I'll come back to you.